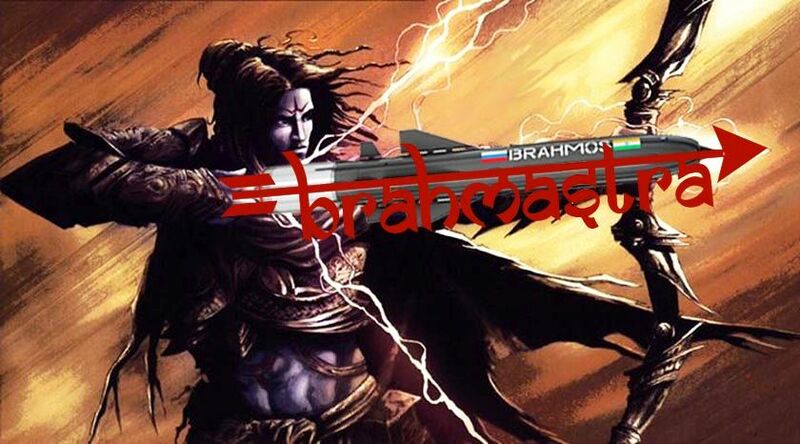 Brahmastra (Sanskrit: ब्रह्‍मास्‍त्र, Brahmāstra) was a weapon created by the creator Brahma, for the purpose of upholding Dharma and Satya (truth). When the Brahmastra was discharged, there was neither a counterattack nor a defense that could stop it, except by Brahmadanda, a stick also created by Brahma. It could be evoked by user after severe concentration and meditating on its creator and could be used only once in a day to destroy an enemy, who could not be defeated by any other means. Brahma had created a weapon even more powerful than the Brahmastra, called the BrahmaSirōnāmāstra, which was never used in war, as it had power equivalent to (Brahmāstra)4, representing 4 heads of Brahma and in Mahabharata war, it was known only to Dronacharya, Aswatthama, Arjuna and Karna. Brahmastra also causes severe environmental damage. The land at which it falls becomes barren for many centuries and both men and women became infertile in that region. Greenery will vanish, rainfall would decrease and land will develop cracks as in drought. People in that region will be genetically effected and will give birth to defective children for next few generations. All these descriptions indicate that Brahmāstra was indeed a nuclear weapon, as the effects sound similar to what happened in Hiroshima and Nagasaki of Japan during 2nd world war. Brahmastra usage was mentioned multiple time in puranas and epics. Viswamitra used it against VaSishTa, but the Brahmastra was absorbed by Brahmadanda as VaSishTa was brahmarshi (rishi capable of alternate creation like brahma). In Ramayana, Rama tried to use it to make way out of sea so that the army of Vanaras can march towards Lanka. But Samudra (lord of oceans) appeared and told Rama, about the technical issues of using the weapon and requested not to dry the ocean and kill all living beings in it. So, Rama aimed it towards Dhrumatulya, which fell at the place of modern day Rajasthan causing it to become a desert. Later, Rama chose to built a bridge, which still exists between India – Sri Lanka. Indrajit used Brahmastra to capture hanuman, who was destroying Ashok Vatika after discovering Seetha. Indrajit also used it against Lakshmana, but it was counter attacked. During the confrontation of Arjuna and Aswatthama in Mahabharata, both have evoked BrahmaSirOnAmAstra but the combined power of both weapons would have ended all life on earth. So Veda Vyas interfered and asked them to withdraw their weapons. Arjuna could called it back but Aswatthama had no idea of recall, so he re-directed it to attack the unborn grandchild of Arjuna (Parikshit) who was still in his mother’s womb. There are multiple weapons described in puranas and vedas like Agneyastra, Brahmastra, Garudastra, Kaumodaki, Narayanastra, Pashupatastra, Shiva Dhanush, Sudarshana Chakra, Trishul, Vaishnavastra, Varunastra, and Vayavastra; but the trishul, Sudarshana Chakra and the Brahmastra, are the most powerful. Brahmastra is released by Gayatri Mantra but in a different way. Any weapon or even a grass straw can be energized by concentrating and spelling Gayatri Mantra in exact reverse sequence of its syllables. This method of chanting a mantra is known as viloma (normal way is anuloma). Combined effect of anuloma-viloma chanting multiplies the power of that mantra and sadhaka attains siddhi quicker than normal. If it is so simple, then why can’t everyone who knows Gayatri mantra release Brahmastra ? In mantra SAstra, a sadhaka (practitioner) gains siddhi over a mantra only after practicing it for certain period of time for a specified number of times with immense concentration. So, one has to be initiated to chant Gayatri Mantra first in a proper way, then one has to practice it for many years and gain command over it. Then he has to practice the reverse chanting of that mantra in same speed and frequency and again attain siddhi in it. Only after this, a person is trained how to chant Gayatri mantra for Missile purpose. He has to gain siddhi on it, and when he acquires it, he gets energized. With that energy when he releases even a grass straw by chanting that mantra it turns into Brahma Missile due to his own charged energy and the missile inturn derives it’s power from the creator, Brahma. The entire mantra SAstra is based on the concept that sounds producers vibrations and inturn frequencies which can kill, heal or transcend. We have seen practically how high pitch sound breaks glass and even other objects as well. Atharva Veda has proved that mantras can change weather, bring rainfall, produce heat, change thoughts in human minds around us, control animals and birds etc. When a Sadhaka meditates and raises his Kundalini (Brahmastra in this context), it derives energy from his base chakra (Mooladhara) and propels upwards. Then, it penetrates through 5 other chakras deriving energies from each of them at every stage. Finally it hits the target : Crown Chakra (Sahasrara) and explodes there with a brilliance. That explosion annihilates all “Illusion(Maaya)“, and leaves the sadhaka with the debris called as “Aham Brahmasmi (I’m Brahma)” feeling. 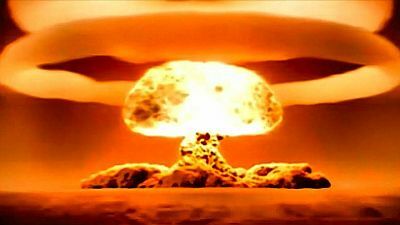 We don’t need to evoke Brahmastram today and kill people or destroy the creation today. Instead, we can practice Gayatri Mantra with reversed syllables and release our inner Brahmastra to achieve our target of Nirvana or Salvation.